Manufacturer of a wide range of products which include automatic scrap baling press, scrap baling press, iron scrap baling press, vertical scrap baling machine, single compression machine and double front ejection iron scrap baling press. With the support of our adroit professionals, we provide our clients a high quality Automatic Scrap Baling Press. 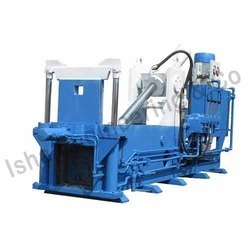 Used in the melting of ferrous and non-ferrous scrap, provided baling press is made using the finest quality components by our skilled professionals in tune with set industry norms. 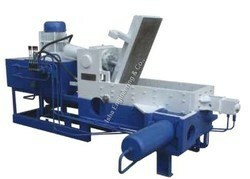 Owing to its unique features, this baling press is widely appreciated by our prestigious clients. 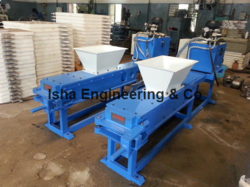 Clients can avail the offered baling press from us at nominal prices. 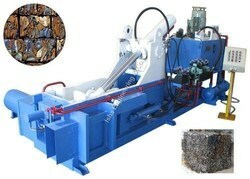 We are manufacturers, Supplier and exporter of Scrap Baling Press. Our Iron Scrap Baling Press that is highly automated and simple in operation with single compact unit mounted over the channel. Fabricated in compliance with set International quality standards, the range is used in the melting of ferrous and non-ferrous scrap. 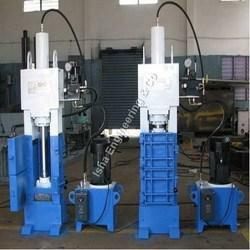 We offer these presses in customized solutions. Manufactured with utmost precision, scrap baling press is used in diverse industrial sectors including stainless steel, automobile, sugarcane and many others. We are manufacturer, Supplier and exporter of Iron Scrap Baling Press. Our Iron Scrap Baling Machine that is highly automated and simple in operation with single compact unit mounted over the channel. Fabricated in compliance with set International quality standards, the range is used in the melting of ferrous and non-ferrous scrap. We offer these presses in customized solutions. Manufactured with utmost precision, scrap baling press is used in diverse industrial sectors including stainless steel, automobile, sugarcane and many others. 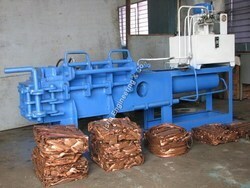 We are manufacturers, Supplier and exporter of Vertical Scrap Baling Machine. Our Iron Scrap Baling Press that is highly automated and simple in operation with single compact unit mounted over the channel. Fabricated in compliance with set International quality standards, the range is used in the melting of ferrous and non-ferrous scrap. We offer Single Compression Machine with single compact unit mounted over the channel. The machine is highly automated but simple and safe in operation. Tested on stringent quality standards, the machine is durable and designed in compliance with established industrial standards. Reliable in performance, it is rust, corrosion and abrasion resistant and low on power consumption and maintenance. We provide customization and cater to industries like automobile, bore well rig manufacturing, defense and engineering industries. Baling Chamber (WXHXL) 12"x16"x 45"
To meet the diversified requirements of our prestigious clients', we are offering an assorted range of Double Front Ejection Iron Scrap Baling Press. Our highly skilled professionals manufacture this ejection from superior quality components and modern technology in tune with set industry norms. Widely used for melting scraps, the offered ejection is tested against various parameters by our quality examiners so as to ensure its quality. Bailing Chamber (WXHXL) 20"x20"x45",24"x30"x57", 30"x38"x74"	,40"x48"x84"
We offer Triple Compression Machine that is capable of compressing all types of metal scrap materials. The high strength machine is reliable in performance and easy in operation. The machine is able to compress various left-overs, metal structures, animal feed block, agricultural waste and wooden blocks. This finds application in textiles and leather processing industry, bore well rig manufacturing industry, engineering industry and automobile industry. Customization is provided as per the requirement of the client. Bailing Chamber (WXHXL) 20"x20"x45" 24"x30"x57" 30"x38"x74" 40"x48"x84"
Bale Size 12"x12"x8-10" 15"x15"x8-10" 15"x15"x8-10" 20"x20"x10-20"
We are remarkable entity, engaged in offering high quality Double Bottom Ejection Iron Scrap Baling Press. Our offered ejection is manufactured under the guidance of our adept professionals from premium quality components and cutting edge technology in compliance with industry set standard. In order to ensure flawlessness, this ejection is thoroughly tested by our quality controllers on various parameters. The offered ejection is used in varied mechanical industries. 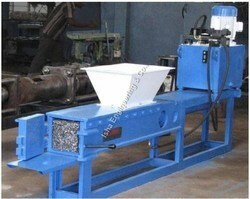 Looking for IRON SCRAP BALING PRESS ?